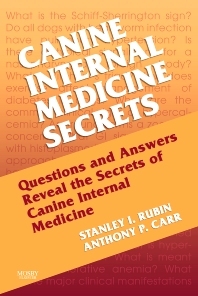 Part of the popular Secrets Series®, this new text provides essential, practical information for reviewing canine internal medicine topics commonly encountered in clinical situations. Organized by disorder type, it features numerous photos, a popular question-and-answer format, and a detailed index that makes it easy to find information quickly. In 10 concise chapters, expert contributors pose key questions and provide authoritative answers addressing the situations that confront small animal veterinarians every day. Authoritative coverage is provided by a team of nationally recognized canine internal medicine experts. All of the most important "need to know" questions and answers are offered in the concise, proven format of the acclaimed Secrets Series. More than 65 superior-quality illustrations highlight key concepts. A thorough, highly detailed index provides quick and easy access to specific topics.